Hendaye Cross & Harney County...Is there a Link? The Great Cross of Hendaye is a stone cross located in the town square of Hendaye in the Pyrenees-Atlantiques , in southwestern France. Based on the book, The Mystery of the Cathedrals by Fulcanelli, Jay Weidner and Vincent Bridges co-wrote, The Mysteries of the Great Cross at Hendaye: Alchemy and the End of Time regarding the codes left on the Hendaye Cross and how the information connects to sacred alchemy, The Great Shift and Peru. I haven't read the books yet, but did watch the movie they produced called, "Timewave 2013". While I watched the movie I began to take notes as I noticed some of the information seemed to be correlating to my own research with Harney County in Oregon and it's connection to Peru. Fulcanelli’s description of the phrase is describing "a place of refuge ‘and we learn that a country exists, where death cannot reach man at the terrible time of the double cataclysm’." Fulcanelli noticed that this inscription is unique and important because of the misplaced S at the end of OcruxaveS. 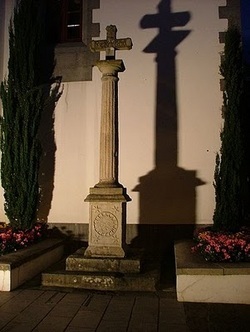 When they did an anagram on the Latin inscription it came up, "Ave X urcos", which means, "Hail to the cross of Urcos"
According to Weidner in, "A Monument to the End of Time", the "ocruxaves pesunica" engraving really means "the secret concerns a cross and a snake which somehow measures the 12th part". I had this nagging feeling there was more to the Latin inscription, so I decided to have some fun doing some anagrams and found these. Ocruxaves Pesunica.......... “ Curvacious Expanse”! Cavi Superna Excuso...............Excuse Hollow Superna..........There is no English translation for "Superna", however Websters suggested "Supernal"........1. being in or belonging to the heaven of divine beings; heavenly, celestial, or divine. 2. lofty; of more than earthly or human excellence, powers, etc. 3. being on high or in the sky or visible heavens. The Mayans speak of an opening in the center of the Milky Way galaxy. And from this center a ladder emerges and from this ladder a serpent rope appears. Riding upon this serpent rope an enlightened Being or group of Beings appear. If we follow the term riding the serpent rope we see throughout ancient records many enlightened beings riding on serpent ropes and we see many of these beings entering earth through gateways. We could also use the term “wormhole or stargate is going to open from the galactic center” instead of a serpent rope. Ophiuchus is the serpent holder and lies in the center of the galaxy. I believe this is the sign that lies over and governs all the other 12 signs…the sacred 12 and 1. I noted in reference to “the secret concerns a cross and a snake which somehow measures the 12th part” may very well relate to Ophiuchus, who is the serpent holder, who is in the center of the galactic cross in our “12th part” of this particular cycle. When Jay Weidner came up with "Hail to The Cross of Urcos", he looked up the word "Urcos" and sure enough discovered there is a small village in Peru named Urcos, 20 miles south of Cuzco and there stands a cross by a lake known as Lake Urcos. So I sat feeling a little dumbfounded at this connection because my intuition was telling me there was more than this alignment and the Peru co-inky-dink . I reflected on all the numerous synchronizations that have occurred since I discovered this ancient site in Oregon, how my logical mind said no so often, yet I continued to follow my inner guidance and time after time it proved to be correct. I sat at my computer and wondered about the above alignment. Aside from this alignment, could it be possible the ancient route from the Archangel to Peru was also somehow in connection with the Hendaye Cross to Peru? Could it be possible the Archangel was somehow connected to the Hendaye Cross as far fetched as that may sound? So I ran an anagram using a generated anagram tool online on "Hendaye Cross" and "Harney Co." came up….Needless to say, I was quite shocked since Harney County is where the Oregon site is! I sat gazing into the letters of "Hendaye Cross" and did the anagram the old fashioned way to confirm what the online tool did...........in a way a "pinch myself moment", but as I was doing it I discovered something. Absolutely stunned, I ran an anagram on "Harney County Angel"…….What came up? ”A Holy Entrance” of all things. Immediately I recalled the woman in New Mexico who can read petroglyphs from a higher state of consciousness. When she read the script on the tablet the Hatman is looking at, I saw a pyramid outlined in red and heard the words, "On All That Is Holy". A few weeks went by and while working on the star systems and their alignments I felt a strong impulse to do the anagrams again. When I ran "Harney County Angel" again I noticed the letters "y,u,n,g" were left over from "A Holy Entrance", so instead of blowing them off like I did the first time, I looked online to see if there was such a word as "yung", but there wasn't, instead there was "yunga". "In Quechua, the word “Yunga” means “Warm Valley”. "The Yunga is one the Natural Regions of Peru and Bolivia. It is formed by valleys, fluvial mountain trails and streams where people cultivate native plants like the Canistel or eggfruit tree, the lucumo tree, the cherimoya or chirimoya, the guava or guayabo and the avocado or palta. Like the surrounding areas, it has characteristics of the Neotropic ecozone. It is rainy, humid, and warm. The Afro-Bolivian community is concentrated there from the days of slavery. The World Wide Fund for Nature has delineated three yungas ecoregions along the eastern side of the Andes. The northernmost is called the Peruvian Yungas, located entirely within Peru and stretching nearly the whole length of the country. The Bolivian Yungas lies to the south, mostly in Bolivia but including part of southern Peru. The Southern Andean Yungas begins in southern Bolivia and continues south into Argentina. In addition, there is also a famous road called Yungas Road and originates in La Paz near Tiahuanacu. "The North Yungas Road (alternatively known as Grove's Road, Coroico Road, Camino de las Yungas, El Camino de la Muerte, Road of Death or Death Road) is a road leading from La Paz to Coroico, 35 mi northeast of La Paz in the Yungas region of Bolivia. It is legendary for its extreme danger and in 1995 was christened as the "world's most dangerous road". So, I did the anagram again, this time using all letters in "Harney County Angel" and it came up as "Yunga Holy Entrance"........aka "Peru Holy Entrance" where the ancient route originating from the Angel aligns. What are Harney's Codes? I believe that is a many layered question, so I did another anagram this time only using "Harney Angel". What is she communicating aside she is a Holy Entrance to Peru? Heal Granny.........Heal Grandmother........The Earth? The Matriarchal? The Divine Feminine in us all? Her Yang Lane.........Her "Divine Feminine" Ancient Route? He Learn Yang..........The Patriarchal learning to come back into balance with the "Yang"? Then I really dove into the world of anagrams! I have found anagrams are an extremely interesting world, one of which only speaks the truth pertaining to the past, present or future. Back in 2004 I was on my way home from the grocery store one day and asked my Soul to explain more about the shift of consciousness programming from the mid-east to the mid-west that corresponds with this Shift of Consciousness humanity is going through. I was told to do an anagram on the word "Missouri". When I got home I found an anagram tool online. So I typed in Missouri and what came up? Sirius, Osiris and Isis. I was sold ever since. Alcyone = Pleiades Star System...........In Incan the Pleiades refers to "Seed Scatterer or Sower".......http://www.crystalinks.com/pleiades.html. Hen = Feminine or Pleiades........... In Old English Pleiades refers to "A Hen and her chicks" and in Europe, they still refer to women as Hens. Agency = Councils or Hierarchy? Hanger = What would a "Hanger" be considered out in the Boonies? Maybe a Cave? As you can see below there are numerous anagrams. Most may not have anything to do with anything, but I found them pretty interesting so I thought I would share them. Son Arched Crosses........Connection between Hendaye, Urcos and Harney Crosses? Son Searched Cross..........Jay Weidner and Fulcanelli studied Hendaye Cross? Encased Cross..........Hendaye and Urcos Crosses? Anchored Crosses.........Hendaye, Urcos and Table Rock? Hyenas Cross Codes.........Hendaye Cross Codes? Ashy Encoders Cross.........Harney Cross created by Oregon configurations? Ranchers Codes.........Eds ranch crop circle? Search Coyness Rods..........Search hidden rods? Archangel Seeds Yon.......Yon is an older version of "yonder". Necessary Angel Hod......... Hod:........a hot basket for carrying earth or coal. In Hebrew "Hod" means "majesty". Reach Angels Doyens...........Doyen: The senior member, as in age, rank, or experience, of a group, class, profession, etc. Angel Races Eons........The Angelic Races here for eons? Reaches Angel Synod...........Reaches Angelic Realms? Head Larynges Cone..........The Angels throat triangle? Hyena Cross Legend...........Sirius Cross Legend? Hyenas Gal Encoders......Sirius Feminine Encoders? Godly Hen Cesarean.........Could this mean "Godly Feminine gives birth"? If so, gives birth to what or whom? Hen Relays Decagons ........Decagon: In geometry a decagon is any polygon with ten sides and ten angles and usually refers to a regular decagon, having all sides of equal length and each internal angle equal to 144°. Genera Halos Synced.........Genera: A class or group of individuals, or of species of individuals. Holy geneses canard.........Geneses is plural for "multiple genesis or the coming into being of something; the origin". Canard is "a false report or hoax". Is this saying "Holy origins is a false report and hoax"? If so what does that mean? Does it perhaps mean to say what our family of humanity views as our Holy origins is false? Halo Energy Ascends..........Our Light Bodies? Eagles on Harney............Harney and Malheur Counties are known for being Golden and Bald Eagles nesting locations. Realness Changed..........Our reality altered through the Shift of consciousness? Dacha energy noels.........Gifts of "songs of energy"? Serenade Yangs Loch...........There are numerous ancient lakes in Harney Co. The day I found the Angel is the day a man witnessed orange orbs going into Summer Lake. Reached Yangs Noels..........Connected with Divine Feminine Frequencies? Search Yangs Noel..........measure electromagnetic frequencies? Hyena Seal Song.........The codes or song to activate the seal comes from Sirius? Cleanse Dragons or Dragons cleanse? Hangar Decoy Lessen.........A Cave decoy? See Second Hangar...........See Second "Cave"? Dacha energy lesson.......Dacha is Russian for "allotment of land, a giving or gift". Glory Encased Ash........The Glory of these lands have been covered in ash? Congeal Dense Ash...........Soften hard rock? Is this how the configurations were created? Glances Sheeny Road............Ancient Route? Path of Flight/starmap? Future? Oranges Sea Den.........Harney County was once covered by sea. There are remains of salt lakes and ancient lake beds all over. Orange Candles...........The Orange Orbs seen going into Summer Lake? Seer Synched Analog.........Seer's succeed in aligned conscious communication? A Hyena Cross Legend..........Hendaye Cross? So what is all this saying? What is it the anagrams might be possibly telling us?